Detailed descriptions of the alternative routes to Machu Picchu taking you away from the crowds. Detailed section on the Manu and Tambopata jungle reserves, with advice for taking a tour. In-depth background section tells you everything you ever wanted to know about the Incas. Extensive hotel, restaurant and nightlife listings and full festival and events guide. Great coverage of the top activities and sights in the region, including following Darwin's footsteps in the Galápagos; spectacular costumed festivals; sacred pyramids and temples; the mystical Lake Titicaca. Loaded with information and suggestions on how to get off the beaten track, from where to find the best artesanía to seeking jaguars in the rainforest. Includes comprehensive information on everything from transport and practicalities to history, culture & landscape. Plus all the usual accommodation, eating and drinking listings for every budget. Full-colour planning section to inspire you and help you find the best experiences. The DK Eyewitness Peru Travel Guide is your indispensible guide to this beautiful part of the world. The fully updated guide includes unique cutaways, floorplans and reconstructions of the must-see sites, plus street-by-street maps of all the fascinating cities and towns. The new-look guide is also packed with photographs and illustrations leading you straight to the best attractions on offer. The uniquely visual DK Eyewitness Travel Guide will help you to discover everything region by region; from local festivals and markets to day trips around the countryside. Detailed listings will guide you to the best hotels, restaurants, bars and shops for all budgets, whilst detailed practical information will help you to get around, whether by train, bus or car. Plus, DK's excellent insider tips and essential local information will help you explore every corner of Peru effortlessly. De auteurs en fotografen laten u in woord en beeld kennismaken met dit veelzijdige land. In het eerste gedeelte leest u alles over de boeiende geschiedenis en cultuur van de bevolking, waaronder de stammen in het Amazonegebied. Vervolgens nemen de auteurs u mee op reis van Lima naar het hart van de Andes en van de Heilige Vallei naar de oevers van het Titicacameer. Deze hoofdstukken worden afgewisseld met thema- en wetenswaardpagina's over onder andere 'Feesten en Festivals', ‘Begraven schatten’ en ‘Isla Taquile’. De gedetailleerde kaarten en prachtige kleurenfoto’s maken deze gids compleet. In het gedeelte 'Reisinformatie' vindt u alles over vervoer, accommodatie, restaurants, reisbenodigdheden, noodgevallen, gezondheid, toeristische tips, uitgaan, klimaat, winkelen, nuttige adressen en talloze andere wetenswaardigheden. Insight Guide Peru is hierdoor niet alleen een bron van informatie en inspiratie, maar ook een bijzonder praktische reisgids. Newly updated edition of Insight Guides Peru. Over 345 pages of insider knowledge from local experts. Innovative extras, incredible value and unique in the market. All Insight Guides to countries and regions come with a free eBook and regularly updated app. High-production values, smart flexi-binding and first-rate, full-colour photography throughout. Content overview: in-depth on history and culture; invaluable maps, travel tips and practical information ensure effortless planning; inspirational colour photography throughout. Inventive design that makes for an engaging reading experience. Peru's Sacred Valley, home to world famous Machu Picchu, is fast becoming a haven for mountain bikers, hikers and climbers. This guide describes the many different routes and maps that, until now, have never been published or described. Peru's Inca Heartland is home to lost cities, ancient trails and colonial palaces. Our Cuzco, Machu Picchu & the Inca Heartland Handbook will guide you around the Navel of the World, along challenging Inca routes, and up to the magnificent Machu Picchu. From biking in the Sacred Valley to the spectacular ruins at Ollantaytambo, our fully updated 6th edition will help you navigate this fascinating destination. In deze reisgids wordt het gehele land beschreven: de bekende steden Lima en Cusco, de wonderbaarlijke archeologische vondsten zoals Machu Picchu, de inheemse bevolking en haar tradities, en de prachtige woestijnlandschappen langs de kust, het onherbergzame hoogland en het uitgestrekte junglegebied daarachter. Bezoek de archeologische vindplaatsen Chan Chan bij Trujillo, ga kitesurfen in het uiterste noorden en trek door het junglegebied rond Pucallpa of Iquitos. Ontdek de mystiek van Peru. Marja Kusters verbleef voor haar promotieonderzoek langere tijd in Peru en verkende daar de meest afgelegen oorden. Nu geeft ze les aan de faculteit Communicatie en Journalistiek van de Hogeschool Utrecht. The world's best-selling guidebook to Peru; Feature chapter on Peru's red-hot, world-reknowned cuisine scene as well as outdoor activity coverage; enviornmentally responsible content with eco-friendly lisitngs and tips on travelling sustainably; also insightful coverage of ancient and contemporary Peruvian culture. Inside Lonely Planet Peru: Color maps and images throughout. Highlights and itineraries help you tailor your trip to your personal needs and interests. Insider tips to save time and money and get around like a local, avoiding crowds and trouble spots. Essential info at your fingertips - hours of operation, phone numbers, websites, transit tips, prices. Honest reviews for all budgets - eating, sleeping, sight-seeing, going out and shopping. Cultural insights give you a richer, more rewarding travel experience - history, cuisine, music, the arts, nature. Over 70 color maps. Covers: Lima, Amazon Basin, Huaras, Cordilleras, Central Highlands, Chan Chan, Cuzco & the Sacred Valley, Lake Titicaca, Arequipa, Canyon Country. Offering visually-inspiring content along with the most relevant, up-to-date advice on what to see and skip, and what hidden discoveries await you, this photo-rich, user-friendly guide makes planning fun and easy. Discover the best of Peru and begin your journey now! Inside Lonely Planet Best of Peru: In-depth coverage of the destination’s must-see sights. Eye-catching full-colour design and easy-to-use layout with maps and images throughout. Annotated images that bring a destination to life. Practical planning and transport tools including a fold-out map that gives instant access to must-see sights to help you navigate as you plot out your itinerary. Short and extended itineraries to help you tailor your trip to your personal needs and interests to make the most of your time on the road. Insider tips and insights to save time and money, avoid crowds and trouble spots, and to get to know the destination like a local. Honest recommendations for all budgets. Cultural insights and background information to put top sights and experiences in context and to give you a richer, more rewarding travel experience (includes history, outdoor activities, environment, wildlife, cuisine, music, arts, and language). Covers: Lima, Islas Ballestas, Nazca, Arequipa, El Valle Sagrado, the Cordilleras, Lake Titicaca, Cuzco, Machu Pucchu, Huaraz, Trujillo, Iquitos and Amazon Basin. Provides information for the walker to plan and enjoy hiking the Inca trail to Machu Picchu in Peru, choosing from three routes taking from 2-7 days. This book includes advice on how to prevent and manage altitude sickness; background on Inca culture and the ruins; and advice on planning given changed Trail regulations. National Geographic Reisgids Peru is een exclusieve gids met sublieme fotografie die u meeneemt naar de bekende en minder bekende bezienswaardigheden. De experts van National Geographic nemen een kijkje achter de schermen en dringen door tot de kern van de cultuur, de geschiedenis en het volk van het land. The Cordilleras Blanca and Huayhuash boast some of the most spectacular scenery in the Andes, and some of the most accessible high altitude trekking and cycling in the world. Perfect pyramidal peaks, gargantuan ice falls and turquoise alpine lakes are all easily reached from Huaraz, the region's capital and centre of tourist comforts. This practical guide contains 50 detailed route maps and descriptions covering 20 hiking trails and 30 days of paved and dirt road cycle touring. The Rough Guide to Peru is the ultimate travel guide with clear maps and detailed coverage of all the best attractions Peru has to offer. Discover the varied and exciting country of Peru whether exploring the breathtaking Machu Picchu, traversing a rainforest canopy walkway in one of the world's richest jungles or hiking the Inca Trail, the Rough Guide to Peru makes sure you make the most out of your time in Peru. Packed with detailed, practical advice on what to see and do in Peru; this guide provides reliable, up-to-date descriptions of the best hotels in Peru, recommended restaurants in Peru, and tips on everything from shopping to festivals in Peru for all budgets. 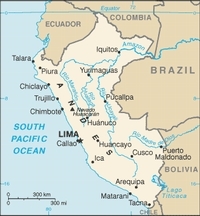 Includes Santa Teresa Trek, Choquequirao Trek, Vilcabamba Trail, Lima City Guide. This guide includes hiking options from two days to three weeks with 40 detailed hiking maps showing walking times, camping places and all points of interest. It is the only guide to have: really in-depth information on all the ruins, not just Machu Picchu, eg the ruins around Cusco, as well as major sites such as Choquequirao, all the Inca Trail sites, Vitcos, Espiritu Pampa etc. ; great detail about the longer link routes connecting Cachora/Choquequirao to Machu Picchu (one of the best multi-day trips in the Andes) and Cachora/Choquequirao to Huancacalle or even Espiritu Pampa (the longest route in the region). These are less busy and less regulated than the Inca Trail. Het echte verhaal achter de klassieke trekpleisters - Tips om de verborgen parels buiten de platgetreden paden te verkennen - Verrassende anekdotes en topervaringen van Trotter - Honderden budgetvriendelijke en uitgeteste horeca-adressen - 30 kaarten en plattegronden waarop je al onze adressen terug vindt.